Although we’re still a ways away from seeing the data deluge that’s sure to come as the internet of things becomes more mainstream, that doesn’t mean storage startups aren’t busy creating technology designed to handle the flood of data. Launching Wednesday, a new Sunnyvale-based storage startup called Springpath is flaunting its solution to the oncoming data deluge: a software-designed storage strategy that promises to allow customers to more efficiently store data in their server infrastructure without having to buy more hard drives. Springpath, like other software-defined-storage startups like Primary Data and Qumulo, believes that modern-day data centers for the likes of a typical business (not the Googles or Facebooks of the world) are “highly fragmented” and littered with too many hardware appliances from multiple vendors, explained Springpath CEO and CTO Mallik Mahalingam. Compounding the problem is that each appliance has its own management plane that conflicts with the other devices, he said. What Springpath wants to do is unify all of the storage in a company’s data centers through the use of software, but what makes it different is that the underlying Springpath software “runs on top of commodity servers” as opposed to the storage hard drives themselves, said Mahalingam. The Springpath team said that modern-day commodity servers contain enough storage built inside them that they can be used as both suppliers of compute and storage. The startup’s founders, who came from [company]VMware[/company] (Mahalingam said he is the inventor of the VxLan virtual networking technology), think that their proprietary software coupled together a server will be more efficient than storage arrays whose technology might be decades old. At the heart of Springpath’s technology is its distributed file system called HALO, which the company spent the past three years developing from the ground up. With the the HALO architecture, users should be able to link up all of their servers and access the types of data management services that you’d come to expect from other software-defined storage startups. These services include data caching, intelligently distributing the data across the devices for better performance and data de-duplication, which essentially removes duplicate copies of data that are hogging the system. By putting a company’s data in one single device that does both compute and storage, Mahalingam explained that this could significantly save a company money in buying excess storage drives. Of course, having both storage and compute bundled in one appliance could pose problems if the device shuts down for some reason, taking both the computing and data down with it. However, Springpath’s software apparently takes in account failover, so if one device goes down, another one should come back online. If you want to use Springpath’s software in your data center to connect to the public cloud, as of now the startup only supports vCloud Air and “anything that’s coupled with the VMware environment,” but plans are to eventually support other public cloud environments, Mahalingam said. 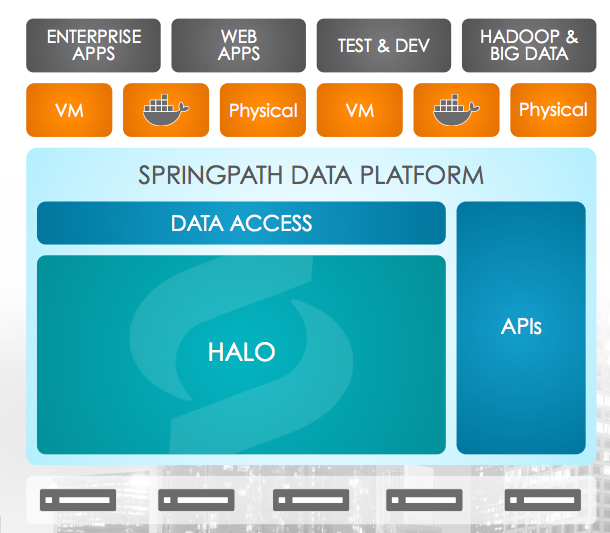 Springpath also doesn’t support Hadoop, so big data aficionados who love the framework may be out of luck for the time being. Mahalingam said Hadoop integration may be on the horizon. The Sunnyvale startup currently has $34 million in total funding from investors including Sequoia Capital, NEA and Redpoint. They just entered an overcrowded market where multiple (both small and big) companies have been selling a very similar and more mature products for several years now. No differentiation compared to existing vendors (vsan, Nutanix, Maxta, SimpliVity and others) And a new file system which will take another couple of years to stabilize.